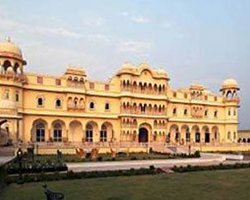 If you are coming to Jaipur to see and explore Rajasthan’s famous forts and palaces then the city will never let you down. There are many magnificent forts and palaces in and around the city of Jaipur in Rajasthan will amaze you on your visit. One of the most sought after tourist attractions and important forts to see in Jaipur is Nahargarh Fort that stands on the edge of the Aravalli Hills, overlooking the panoramic view of entire Jaipur city. For visitors, this grand and historical fort is open from 10:00 AM. Exploring the fort complex will provide you a brilliant opportunity to see the architectural brilliance. Along with Amber Fort, Jaigarh Fort, the Nahargarh Fort once formed a strong defense ring for the city of Jaipur. This magnificent historical fort was originally named Sudarshangarh Fort but later it became popular as Nahargarh Fort. Nahargarh literally means the abode of tigers. The Nahargarh Fort was constructed as a palace of retreat on the summit of the ridge about the city in 1734 by Maharaja Sawai Jai Singh II, the founder of Jaipur. The fort complex is fortified with massive walls extended over the surrounding hills, connecting to the Jaigarh Fort, the fort above the Amber Fort. This grand and historical fort never came under the attack during the period of its history. It has seen several historical events. Built mainly in 1734, this fort was extended in 1868, during the reign of Raja Sawai Ram Singh. A range of beautiful palaces was also constructed at the Nahargarh Fort by Dirgh Patel in 1883-92. There is also a palace called Madhavendra Bhawan built by Sawai Madho Singh at Nahargarh. This Bhawan had a suit for king himself and suites for queens of Jaipur as well. All the rooms are linked by beautiful corridors and still will amaze you with some delicate paintings, murals and frescos. The Nahargarh Fort was also a hunting lodge of the Maharajas of Jaipur. The beauty of the grand Nahargarh Fort has been also captured by some Bollywood filmmakers. Famous Bollywood movies Rang De Basanti and Shuddh Desi Romance and a Bengali cinema Sonar Kella were shot at this grand and historical Nahargarh Fort in Jaipur, Rajasthan.